How many times has the Enterprise been destroyed? For example, we know the Enterprise-C was destroyed in Yesterday's Enterprise when it gets sent back in time, but we don't see it, so that's off screen. This answer provides a good start in answering this question, since it gives counts for the NCC-1701-D, however, we know that in Cause and Effect, the Enterprise was destroyed more than the number of times we witnessed it exploding, since the time loop was repeated a number of times. This would include all the TV shows, TOS movies, TNG movies, and reboot movies. I am basing the following list on Star Trek canon only. Once in each of "Time Squared, "Timescape", and "Parallels"
The Imperial Warship Enterprise was destroyed by the Tholians in "Through a Mirror Darkly"
The correct answer is six times, the Enterprise -the most powerful ship in starfleet- has been destroyed six times, which begs the question, why name a ship after a cursed name? Not the answer you're looking for? Browse other questions tagged star-trek uss-enterprise or ask your own question. 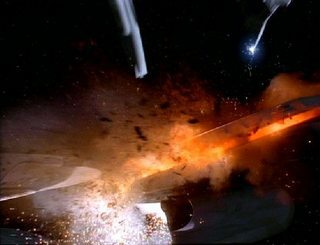 Which starship gets destroyed the most often? Were there REALLY over 73,000 Federation starships commissioned? In TOS, how many shuttlecraft were aboard the U.S.S. Enterprise NCC-1701? How vulnerable to physical hits are Federation ships? How many times has “Make It So” been demanded by anyone other than Picard? How many times has “Make It So” been demanded by Picard in one episode? Should the name “Enterprise” have been retired? How many shuttles the Enterprise-D carried?